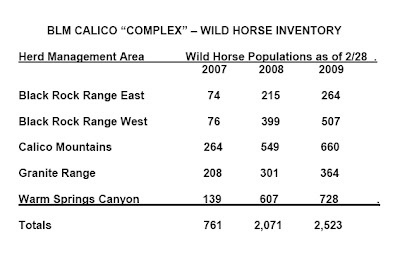 Editors Note 1/05/09: A lot of articles are now stating that BLM increased livestock authorizations for the Calico Complex by 300%. This is incorrect. There are several livestock allotments that affect the Herd Management Areas that comprise the Calico Complex. The analysis given in this article was for one grazing allotment only, the Soldier Meadows Allotment. Furthermore, the 300% increase applied to the Idaho Canyon pasture as described by the fence that was needed to increase livestock from 300 to 800, as well as to other pastures used in the allotment throughout the year, but did not apply throughout the entire allotment at all times of the year due to BLMs grazing rotation systems. Hope this clears up any confusion that has resulted. So everyone panics, Madeleine Pickens arrives to save the day and Restore Our American Mustangs (R.O.A.M.) is born, a legislative attempt to fix the problems BLM tells everyone managing wild horses and burros cause. As the months go by, we listen to arguments about the “spiraling out of control costs” of holding these now captured American icons and how it will continue to escalate to even greater unsustainable levels. We also hear how stopping the round ups will jeopardize the entire Western ecosystems because of their still burgeoning numbers and how native wildlife will plummet if ten thousand “excess” animals, half of which aren’t even a year old, are left on the range. As we watch Madeleine Picken’s Plan fall apart (because it wasn’t enough to have access to a million acres of land for dirt cheap, her extra stipulation of wanting $500 p/horse per year pretty much kills the deal), BLM launches an “experimental” Program limited to only the slaughter belt states where they give mustangs away and cut the new owner a $500 check after a year. 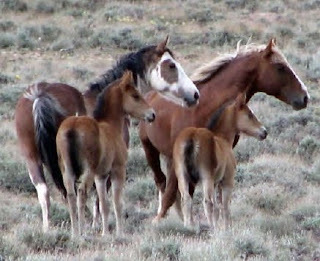 Then the Picken’s Plan to try and help the captured ones morphs into The Salazoo Plan to create zoo’s of domestic horses while simultaneously planning to cut the free-roaming populations supposedly still left on the range to BLM’s 1971 “guesstimate” of 17,500, despite the Interior Board of Land of Appeals (IBLA) ruling years ago that BLM cannot manage for arbitrary and/or historical numbers but must manage them within the carrying capacity of the land in order to maintain a thriving natural ecological balance. Apparently, Secretary Salazar doesn’t read IBLA’s decisions either and we all know BLM has rarely used anything but arbitrary numbers to determine “excess” anyway, so why rock the boat? So with little actually resolved, Congress gives BLM an unprecedented budget to keep the Program afloat so they won’t have to kill all those wild horses in holding - but they don’t ask too many questions or stipulate what BLM can do with the money. BLM returns the favor by issuing a massive Fiscal Year 2010 Round Up Schedule to remove over 12,000 more wild horses and burros at the cost of $32 million dollars, which is pretty much all the extra money above and beyond the cost of warehousing all those mustangs they already removed; despite still having no concrete plans on where to put them or how they are going to feed them. And so we come to the Calico Complex, a collection of Herd Management Areas (HMAs) in Northern Nevada that include the Calico, Black Rock Range East and West, Granite Range and Warm Springs Canyon HMAs slated for removals next month. In BLM's recent Environmental Assessment (EA) where they justify why they need to remove wild horses again, BLM re-affirms the wild horse and burro “allowable management levels” (AMLs) set back in 1993/94 are still totally appropriate today, despite admitting that not one of these HMAs has ever been assessed for conformance with their own Standards of Rangeland Health. Oh yeah, and let’s not forget the drought. BLM shows us photos of a few drought stricken springs and beat up mud holes to prove how urgent it is that wild horses must go! Since 1979, BLM reported they have removed 9,148 wild horses and released 1,884 from the Calico Complex areas. Does anyone else find it strange that within five years, wild horse populations somehow climbed to populations equaling approximately a third of the total of every wild horse BLM has every removed from here since 1971? In what appears to be BLMs newest “cut-n-paste mantra” to explain away yet another population explosion, BLM explains this is most likely merely a result of them being really lousy at counting wild horses and/or hundreds and hundreds of wild horses moved outside the HMA "boundaries” when the choppers arrived in 2004-2005 - but after the choppers left, the mustangs snuck back inside the HMAs. A simple explanation really - so simple even a child could understand. Hmm, now there’s a thought - dumping off previously gathered wild horses back out on to the range to "prove" an overpopulation. Maybe that's why BLM can say with confidence they were "outside the HMA boundaries" - they just don't have to disclose how far outside is! Wonder how many times the government could charge the taxpayers for doing THAT? While we ponder that possibility, let’s look at a few things BLM neglected to mention about what’s been going on in the Calico Complex area that we can prove…. The decision authorized a “range improvement” that turned out to be a fourth fence in Idaho Canyon - even though BLM admitted this fence might entrap wild horses and cause them to die if the gate wasn’t opened before the winter snows arrived. The fence was needed because BLM authorized an increase from the old 300 head of cattle to 800 head with an eventual goal of running a 1,000 throughout the allotment. If that weren’t enough, BLM also stated that every single Animal Unit Month (AUM) of forage on record would also be available for Temporary Non-Renewable cattle grazing as well. Of course, only if BLM determined this extra forage was suddenly available. When BLM wrote the environmental assessments for the Soldier Meadows allotment, they only analyzed the effects of running all those cattle at 30% utilization level, stating this was necessary to maintain enough forage for wild horses. But even at this utilization level, BLM acknowledged increasing the head of cattle from 300 to 800 was going to potentially cause “exploitative competition for limited habitat components, especially during periods of severe winters or drought”. Yes, the same drought that just happens to occur in Nevada one out of three years. BLM admitted there had been livestock trespassing throughout the area since 1998 but never answered if and when this had been remedied. They only measured stubble height on three springs despite citing over 150 were in the area, acknowledged this new grazing authorization might cause them to have to erect new fences to protect water sources but stated this would be decided on a “case by case basis” and in yet another coincidence, the new proposal included a change in grazing rotations that would lock wild horses out of the best pasture with the most abundant water during the driest time of the year. So in January 2008, when BLM is analyzing a grazing proposal, they tell the public that wild horse populations are so minimal they aren’t even bothering to monitor them anymore. Yet merely two months after authorizing every leaf and blade of grass in the area can potentially go to the over 300% increase in cattle they just authorized, BLM reports they have completed a new aerial census in March 2008, which suddenly finds wild horse populations have skyrocketed. If that isn't enough, what BLM does next is even more amazing! Though BLM's entire analysis for the Soldier Meadows grazing allotment was done for a 30% utilization level, when they issue the Final Decision, they suddenly authorized a 50% utilization level instead. Guess they weren’t too worried about what the wild horses would need to eat anymore and here’s my guess why. If this whole livestock thing weren’t messy enough, at the Obama administration's behest, Secretary Salazar and Senator Reid have mandated BLM begin a “fast track” to getting all manner of energy development rammed through on public lands. Enter the Ruby Pipeline, a $3 billion dollar project that will span Oregon, Nevada, Wyoming and Utah and runs smack dab through the middle of the Calico Complex (not to mention the just rounded up Beaty’s Butte HMA in Oregon as well as skirting Sheldon National Wildlife Refuge). So BLM needs to “minimize grazing” along the Right-of-Way (ROW) for three years and may plant food horses and burros hate to eat in order to do it and/or “reduce wild horse and burro populations” to accommodate it. And if you are wondering just what the heck they are talking about during that vague reference to the “possible management actions to provide water sources away from the ROW”, word on the street is, the Ruby Pipeline is going to blow right through and permanently impair at least one of the major summer water sources wild horses have been relegated too (from all those closed fences for exclusive livestock grazing in the pastures). Calico Complex wild horse removals, Click Here. Be sure to include the EA# DOI-BLM-NV-W030-2010-0001-EA in your title. Please be aware that submitting information for this proposal, including personally identifying information such as your name and contact information may become part of the public record. While you may request that BLM withhold this information, they may not be able to guarantee privacy in all instances. What a horribly tangled web the BLM has weaved. Cindy I commend you for being able to trace all these fragments into the inevitable conclusion that of course we all knew already--its all about the $$$$. I encourage all to get over there and leave comments before the deadline. Please send a copy of your comments to the Department of Justice and the GAO. Just when you think "it can't get worse" it does. Janet Ferguson says. . . The GAO, Government Accountability Office, works for Congress at the request of Congress, essentially. I think that the comments on the Calico EA should be forwarded to our respective Senators and to the Senate Committee on Energy and Environmental Resources (where S.1579 is being considered) for maximum impact. These people have the power to call for investigations based upon pertinent information, whether the hearings/investigations are actually Congressional or are sent to the GAO for their further study. This makes more sense than my comment, above.